The action is an 1892 clone and a takedown. Seems to be quite fun to shoot though. 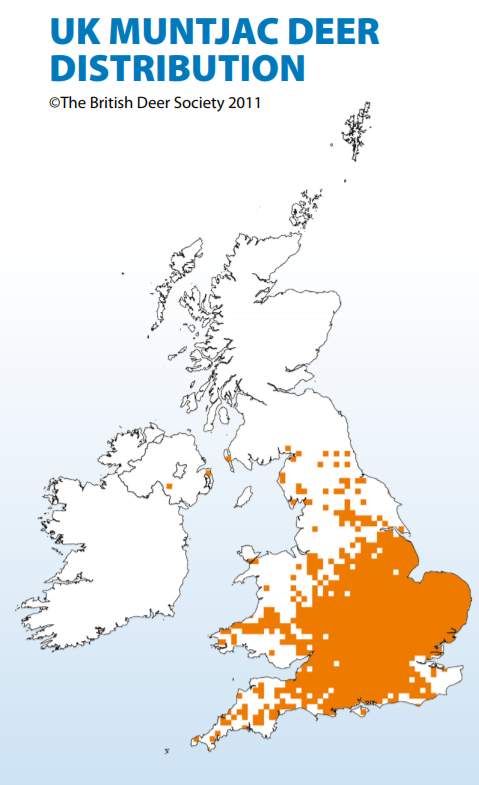 Hoping to get a munjac with it in the next couple of weeks! Next thing to get is a sling. Got a slogan "shotgun" sling coming meaning in theory no drilling for studs (The Kodiak, takedown 45-70 has a front swivel stud). Not sure why the Alaskan doesn't have the same. Now that's a slick looking set-up. 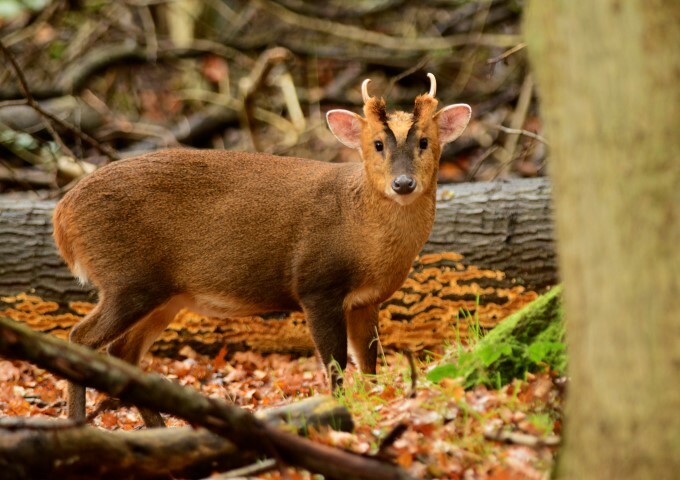 And what is this "munjac" you're hoping to shoot with it? 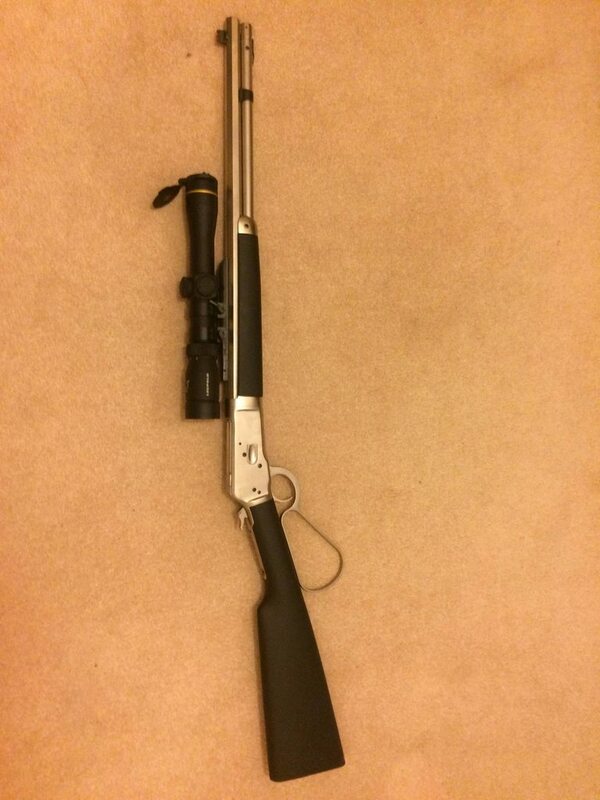 I also put a scope on a m92 type (Browning) a couple weeks ago. I looked at that Leupold scope as being almost perfect for my needs but the eye-relief thing tipped me over to the Burris 2.75x. Nice. I really like .44mag out of a rifle. I have a couple and they shoot well. I use it more than 44-40 cause I'm getting lazy and the 44mag is easier to load. I have NO problem putting sling studs on a gun; it results in a far more reliable sling system, with way less hassle, than the 'no-stud' slings people mess with. I guess on a 'vintage collectible' I would avoid modifying the gun, but then most 'vintage guns' that valuable, I'd just carry them in my hands anyway. So I'd drill and tap the buttstock, and the forend cap, and put a normal sling on it...! The deer are tiny but good eating. Live in dense woodland and can be tricky to get on. They do bark. Roe deer do too. Nathan, Axis deer bark as well, sound just like a little alarmed dog. Sure. Not familiar with them though bud. Nice rifle. I'd just drill that fore-end cap and put a nut inside for the stud. Trim the screw short and maybe have to remove a little wood to get the cap back on. I think it would hold just fine. So far the "Slogun" sling is doing OK but may well hit up getting the stock drilled and tapped for a slingstud. 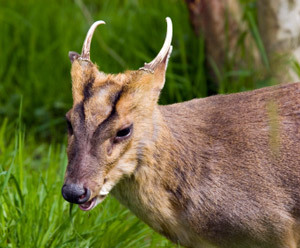 IRRCthe muntjac have fangs/ tusks ? Yup that's the deer I was seeing in my mind- the vampire Bambi. They are tiny little deer right? I hope you get a crack at a good buck with your .44 ! Me too. Current project is to find a lower /shorter front sight post as shoots rather low at the moment. Scrummy just file the front sight down a little, shoot a group , file some & shoot until you are happy with POI. Just go easy or you could take too much with a heavy hand! That was my first thought Gunny but it's a fibre optic one. The sight looks like a Williams Firesight which is about 0.45" high so will try the .343 they make. Ah I understand your search now, guess I missed the fiber optic part. I have added saddle rings to a Rossi, a BLR and an ‘86 and use a single point sling. CHecked that and apparently you can't fit a saddle ring to the Alaskan. Nice to know I'm not alone in that thought process though! Well as I don’t have an Alaskan in front of me I can’t refute that. However, the hammer screw is a screw. A saddle ring can be attached with a screw. I threaded a saddle ring to replace that screw on my BLR. Works a treat. Hi Tycer, you wouldn't happen to have a picture would you? I don’t. When I went down to take pictures I realized I’ve sold the Rossi, swapped out the hammer screw back to original on the 1886 so I could install a model 21 sight and remembered I had just simply drilled and tapped a new hole in the BLR aluminum receiver. What I did on the 1886 was have a replacement screw drilled and tapped for a standard saddle ring. I think I might have used a takedown screw from a Winchester 9422 on that Rossi. I seem to remember buying one off eBay. Take a look at the Winchester saddle ring on eBay. Well, as an update I ordered a 0.25" Williams Firesight this morning so hopefully that will help things on the aiming sighting front! Well folks, a bit of gun plumbing here this afto. Found the front bead on my .44 mag lever action is too tall for a lot of my shooting so I ordered a shorter Williams firesight. Not here yet but hopefully next couple of days. My brass punches arrived today so I drifted out the front sight. As I took the 1.5-5x33 Leupold Scout Scope off it (Eye relief too short), I removed the Burris FastFire from my Supernova pump and put it on the 44's scout rail. Whilst I had the Supernova out I noticed from the Speadbead manual (Mount for the Burris) that the Benelli was supposed to come with some standard spacers (Lettered) that you had to move around to fit the Speadbead. Me thinking to myself "I don't remember those spacers ever being on the gun" I thought I should try some (That Benelli has always shot a bit high for me). So I put on the "middle" amount of drop and cast spacers in and "Wow" now I'm looking straight down the iron sights of the slug barrel and it comes to my eye much easier. Firesight arrived this morning and installed on the gun whilst heating up lunch. Now to get some range time booked!